[UPDATE:] Grand Ole Opry star Little Jimmy Dickens passed away Friday, January 2, 2015 at a Nashville area hospital at the age of 94. Dickens initially suffered a stroke on Christmas Day, and although he had shown some improvements since being admitted, he died today from cardiac arrest. A public visitation has been set for Jan. 7 from 4 p.m.-8 p.m. at Woodlawn Roesch Patton in Nashville, while a public celebration of life has been set for Jan. 8 beginning at 11 a.m. at the Grand Ole Opry House in Nashville. He is survived by his wife Mona Dickens, married since 1971, and two daughters, Pamela Detert and Lisa King. 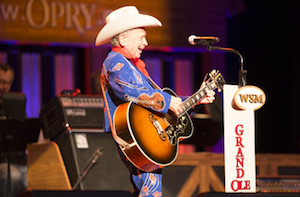 Dickens was the longest running member of the Opry and last performed at the Opry on Dec. 20, 2014. He has been a member of the Grand Ole Opry since 1948, and became a member of the Country Music Hall of Fame in 1983. His hits include “Country Boy,” “Out Behind The Barn,” “May The Bird of Paradise Fly Up Your Nose” and others. Funeral arrangements are incomplete at this time however a public visitation and a public service are being planned. Grand Ole Opry member Little Jimmy Dickens is improving, according to Grand Ole Opry vice president and general manager Pete Fisher who visited the country star in the hospital yesterday. “Each day brings noticeable improvements, and his doctors seem very pleased with the progress he is making. I, along with his family, are grateful to all for your thoughts and prayers,” Fisher says. Dickens was admitted to a Nashville area hospital on Christmas Day in critical care due to an undisclosed illness. Dickens most recently performed on the Opry on Dec. 20, one day after turning 94.